This recipe for Apple Spice Overnight Oats is sponsored by Kemps. As always, all thoughts and opinions are my own. Spiced apples for breakfast? Ummm, yes please. I hear so many people looking for quick and easy breakfast recipes. 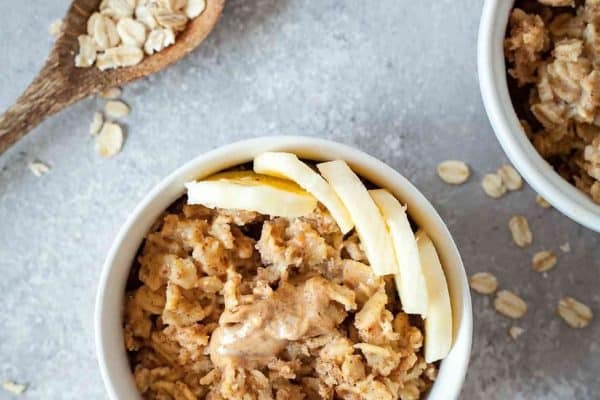 Overnight oats are quick to put together, easily customized, and full of wholesome ingredients like oatmeal (duh), chia seeds (you guys are in love! ), real maple syrup, and probiotic milk. Bonus points that we’re using tons of warm spices to double down on that cozy breakfast feeling. This recipe is for one serving, but it’s very easily scaled up to feed multiple people or keep you in the zone every morning throughout the week. I could totally see making it for a ladies’ brunch or baby shower alongside some extra fruit and maybe a coffee cake. Ok, always a coffee cake. These apple spice overnight oats utilize Kemps® Probiotic Milk. It tastes just like regular milk but has billions of live cultures in every serving (shout out to acidophilus and bifidus!) which helps with healthy digestion. It’s also produced from local family farms so close to my home! This milky miracle is only available in Minnesota and Wisconsin, because we’re some dairy loving people. I purchased this product at the Festival Foods down the street from my house which means it’s easy to find because I live in Tiny Town, USA. It’s easy to replace one serving of milk a day with Kemp’s Probiotic Milk. If you’re not a regular milk drinker, then these overnight oats are a great way to start. 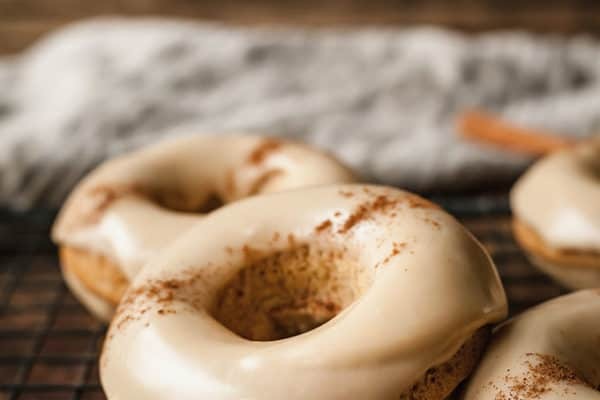 They come out thick and creamy, with plenty of spiced flavor. I like adding the chopped apples just before eating. They stay crisp and juicy, which adds a burst of flavor when mixed with the spiced oatmeal. If you make this recipe be sure to rate it, leave a comment, or tag #theliveinkitchen on Instagram, and if you’re lucky enough to live in Minnesota or Wisconsin, you can find Kemp’s Probiotic Milk next to the regular milk at your local Festival Foods and have an easy breakfast lined up all week! This post may contain affiliate links. If you click on a link and make a purchase, I make a small commission off the sale, which helps me continue providing you recipes! Overnight oats made with Kemps Probiotic Milk, warm spices, and topped with crisp apples and crunchy pecans! In a small mason jar, combine oats, milk, maple syrup, chia seeds, and spices, stirring to combine. Cover and refrigerate at least a few hours, but preferably overnight. When ready to eat, stir again and top with apples and pecans. I’m not a milk drinker but I will eat it when mixed with oats like this. Great recipe and sounds like a great product! I’m the same way! It’s so nice to have a few recipes to use it in. I loooove overnight oats! And I add chia to mine too. This looks like a yummy twist on them though. It feels like a treat but still so healthy! This is such a great idea for a speedy breakfast. Gorgeous photos :). I am in love with overnight breakfast these days! This is filled with flavors and goodness! This recipe might just inspire me to eat oatmeal more often! 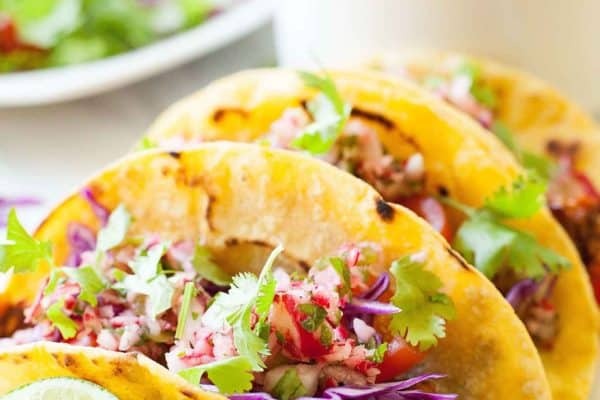 I just love how versatile this recipe is Lindsay! In my opinion, you can’t ever beat overnight oats, as they’re so quick, easy yet delicious. Thumbs up for this one from me! Yum! 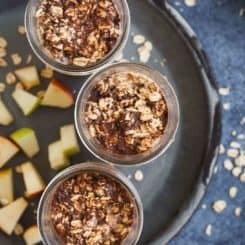 I love overnight oats and apple-spice sounds delicious! I’m all about probiotics these days! This is totally my style of breakfast. Yummm!! I love overnight oat recipes! They are so perfect for breakfast!